Altitude means height above the ground or above the sea level. Common uses include aviation (flying, parachuting, gliding), and geography/surveying. In geometry it is also used as the height of the object itself. Generally, altitude is the distance one thing is above another thing. This is in the vertical or "up" direction. For the height of the ground (such as for hills and mountains), the word elevation is also used and might be a better choice. (Mountain climbers usually use the word altitude, especially when talking about how it affects the body). Buildings and other things on the ground usually just use the word height. 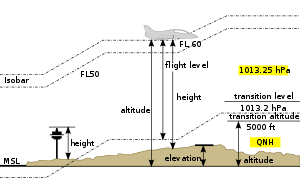 In aviation, the altitude can be measured and shown in several different ways. The height is either from the average sea level (also called Mean Sea Level or MSL), or from the ground (also called Above Ground Level, or AGL). Airplanes can find their altitude by using air pressure. The air gets thinner the higher it is (and it has less pressure, because there's less air pushing down on it from above). This pressure can be measured and this can be converted into a height above sea level. The instrument for measuring altitude is the altimeter (from altitude and meter). The common pressure altimeter is a type of barometer with a dial showing distance (feet or metres) instead of atmospheric pressure. There are several types of aviation altitude. Indicated altitude -- What the altimeter indicates (shows) for the height above sea level. It is usually pretty good, but can be fooled a bit sometimes, it needs to be adjusted to use the local barometric pressure. True altitude -- Altitude as the distance above sea level. Absolute altitude -- Altitude as the distance above the terrain (the ground) directly below it (Above Ground Level). Height -- Altitude in terms of the distance above some point. This can also be called the terrain elevation. Radio altimeters measure this height. Pressure altitude -- Altitude measured using air pressure. The air pressure at sea level is normally 1013.25 millibars or 29.92" Hg, when the air temperature is 15 °C (59 °F). Pressure altitude and indicated altitude are the same when the altimeter is adjusted to use this standard level. Density altitude -- Altitude measured using the density of the air. This depends on atmospheric conditions (mainly heat and humidity). There is a International Standard Atmosphere chart that converts density to altitude. The density of the air also affects how well an aircraft works. Density altitude is affected by barometric pressure, humidity and temperature. On a very hot day, density altitude at an airport (especially one at a high elevation) may be so high that aircraft can not take-off. This most often affects helicopters or an aircraft that is carrying a large amount of cargo. Troposphere — surface to 8,000 metres (5.0 mi) at the north and south Poles – 18,000 metres (11 mi) at the equator. Regions on the surface of the Earth or in its atmosphere that are high above mean sea level are said to be high altitude. High altitude is often said to begin at 2,400 metres (8,000 ft) above sea level. As the air expands from heat, it rises to where the air pressure is less. As it rises, it can expand and it begins to cool. Because of this, high altitude air is cold. This causes an alpine climate. This climate affects the ecology at high altitude. Altitudes above 1,500 metres (4,900 ft) start to affect humans. Humans cannot live in very high altitudes above 5,500–6,000 metres (18,000–19,700 ft) Atmospheric pressure decreases at high altitudes. This affects humans because there is less oxygen to breathe. This can cause illnesses such as altitude sickness, High altitude pulmonary edema (fluid in the lungs), and High altitude cerebral edema (fluid in the brain, causing headaches and confusion). The human body can deal with high altitude by breathing faster, having a higher heart rate, and changing the blood itself to have more red blood cells that can carry oxygen. This can take days or weeks to happen. This works for people who live in the high mountains, and mountain climbers. For climbers, this is called acclimatization. Pilots and other people who go quickly to high altitudes need to be in a space suit, pressure suit, or inside a pressurized airplane, so the air is still the same as at the ground. Above 8,000 metres (26,000 ft), the human body cannot make the needed changes and will eventually die. Several of the world's tallest mountains are this high, the climbers usually take oxygen tanks with them, and only stay for a few hours at the highest levels. ↑ "Layers of the Atmosphere". JetStream, the National Weather Service Online Weather School. National Weather Service. http://www.srh.noaa.gov/srh/jetstream/atmos/layers.htm. Retrieved 22 December 2005. ↑ Webster's New World Medical Dictionary. Wiley. 2008. ISBN 978-0-470-18928-3 . http://www.medterms.com/script/main/art.asp?articlekey=8578. ↑ "An Altitude Tutorial". International Society for Mountain Medicine. http://www.ismmed.org/np_altitude_tutorial.htm. Retrieved 2011-06-22. ↑ 4.0 4.1 Cymerman, A; Rock, PB. Medical Problems in High Mountain Environments. A Handbook for Medical Officers. USARIEM-TN94-2. US Army Research Inst. of Environmental Medicine Thermal and Mountain Medicine Division Technical Report. http://archive.rubicon-foundation.org/7976. Retrieved 2009-03-05. ↑ "Atmospheric pressure". NOVA Online Everest. Public Broadcasting Service. http://www.pbs.org/wgbh/nova/everest/exposure/pressure.html. Retrieved January 23, 2009. ↑ Mark Zachary Jacobson (2005). Fundamentals of Atmospheric Modelling (2nd ed.). Cambridge University Press. ISBN 0-521-83970-X . ↑ C. Donald Ahrens (2006). Meteorology Today (8th ed.). Brooks/Cole Publishing. ISBN 0-495-01162-2 . ↑ "Non-Physician Altitude Tutorial". International Society for Mountain Medicine. http://www.ismmed.org/np_altitude_tutorial.htm. Retrieved 22 December 2005. ↑ West, JB (2002). "Highest permanent human habitation". High Altitude Medical Biology 3 (4): 401–407. doi:10.1089/15270290260512882 . PMID 12631426 . ↑ Peacock, Andrew J (October 17, 1998). "Oxygen at high altitude". British Medical Journal 317 (7165): 1063–1066. doi:10.1136/bmj.317.7165.1063 . PMC 1114067 . PMID 9774298 . ↑ Young, Andrew J. and Reeves, John T. (2002). "21". Human Adaptation to High Terrestrial Altitude. In: Medical Aspects of Harsh Environments. 2. Borden Institute. http://www.bordeninstitute.army.mil/published_volumes/harshEnv2/harshEnv2.html. Retrieved 2009-01-05. ↑ Muza, SR; Fulco, CS; Cymerman, A (2004). "Altitude Acclimatization Guide". US Army Research Inst. of Environmental Medicine Thermal and Mountain Medicine Division Technical Report (USARIEM–TN–04–05). http://archive.rubicon-foundation.org/7616. Retrieved 2009-03-05. ↑ "Everest:The Death Zone". Nova. PBS. 1998-02-24. http://www.pbs.org/wgbh/nova/transcripts/2506everest.html. ↑ Brenner, Barry; coauthors=Cheng, David; Clark, Sunday; Camargo, Carlos A., Jr (Spring 2011). "Positive Association between Altitude and Suicide in 2584 U.S. Counties". High Altitude Medicine & Biology 12 (1): 31–5. doi:10.1089/ham.2010.1058 . PMC 3114154 . PMID 21214344 . "Altitude pressure calculator". Apex (altitude physiology expeditions). http://www.altitude.org/air_pressure.php. Retrieved 2006-08-08. "The Race to the Stratosphere". U.S. Centennial of Flight Commission. http://www.centennialofflight.gov/essay/Lighter_than_air/race_to_strato/LTA11.htm. Retrieved 25 January 2006. This page was last changed on 7 December 2013, at 22:24.